Your bedroom should be a calm, peaceful place where you can relax and get rest. But if it’s filled with clutter and you can hardly move in there, it’s going to be the complete opposite. It’s easy to let the mess creep up on you and before you know it, you’re buried under a pile of junk and your bedroom will no longer be a nice place to be. You need to give the place a cleanout and make the bedroom a place for sleeping again. If the mess is getting on top of you in the bedroom and you don’t know what to do about it, here are some easy ways to declutter the space. Often, people find themselves struggling with clutter in the bedroom because they simply don’t have enough space for everything. It might be that you need to get rid of some stuff but it could also be that you just need to get more storage in there. Replace that tiny wardrobe with nice sliding Rauch wardrobes with enough space for all of your clothes. Try to fit another set of drawers in there if you can and if you’re really struggling for space, consider getting a bed with storage drawers underneath. By putting more storage into your bedroom, you can reduce the amount of clutter laying around and make the room a lot more peaceful. 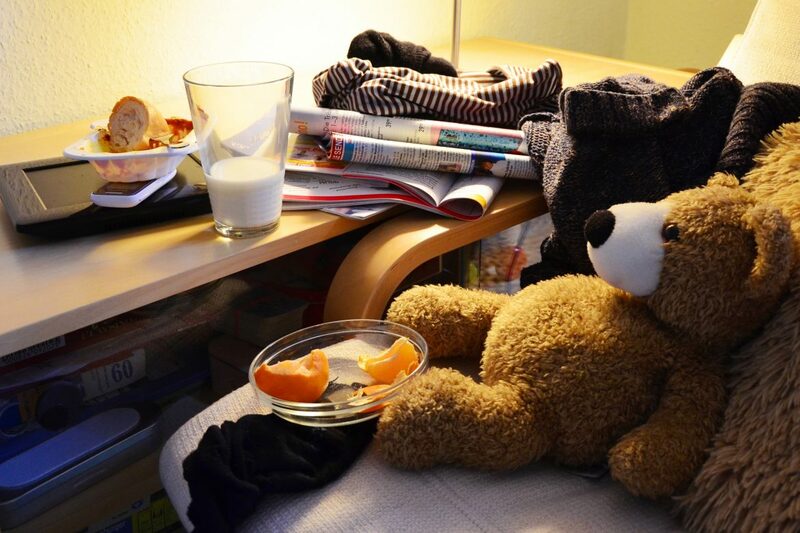 Most of the clutter that you find on the bedroom floor is probably clothes. If you get ready for bed at the end of the day and just chuck all of your clothes on the floor, they’ll quickly cover the carpet. There’s a quick fix for that, just get yourself a laundry basket to put them in instead. Make sure that it’s big enough and, most importantly, it matches the rest of the bedroom decor so it doesn’t ruin the aesthetic. You’ll find that you’ve got more clothing options as well because you’re washing things regularly rather than shoving them under the bed. All of the little bits and bobs you’ve got dotted around like keys or watches can easily make the bedroom look messy. If you don’t have space for them in a drawer and you want them at hand while you’re in bed, bowls and trays are a good option. You can get some nice looking wooden bowls and put them on the bedside table to contain all of the clutter. Clearing out clutter seems like a monumental task if you leave it for ages. You’ll have so much stuff to go through and clear out and most of the time, you’ll just keep putting it off. But if you’re doing it regularly, it’ll take you no time at all. Every week, just spend half an hour tidying up and getting rid of anything that you don’t need. That way, it’ll never build up and you can always keep on top of the mess in your bedroom. These simple decluttering tips will help you to make your bedroom a peaceful and relaxing space where you can get away from it all.